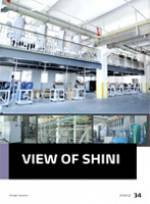 In the development of Shini, we’ve offered numerous optimum plant solutions with strict requirement for each process in the planning of storage, distribution, conveying, molding, water and electricity, and are dedicated to making innovation for the excellence. In the future, our professional team will continue to provide perfect products and services for more customers with solid technologies and rigorous attitude. Now, we’ve launched the sfactory 4.0 smart plant by combining our experiences and advantages with the intelligent development trend. With the demand of management in injection molding plant, the enterprise requires higher automation and informatization level for workshop, and it’s inevitably to achieve centralized real-time management of the injection molding machine and related auxiliary machines. Shini opened the communication interface of the mold temperature controller and data acquisition system provided to one factory of Foxconn and connected it to ERP system of the client as requirement, achieving monitoring and linkage control of all production equipments in the workshop.